The item and its contents remain in a very good overall condition with no scratches or scuffs present. Age of Empires. Age of Empires II: The Age of Kings. Age of Empires II: The Conquerors. Very Good (VG) More than one or two slight defects. Still in collectible condition. Disc in full working order. 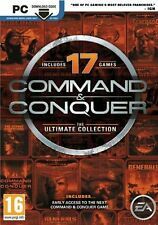 Battlefield 1942: The WWII Anthology (PC CD). 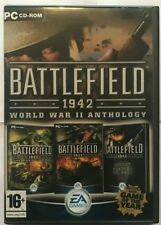 Title: Battlefield 1942: The WWII Anthology (PC CD) Item Condition: used item in a good condition. Sourced directly from the manufacturer or distributor of the original release. 0 Multiple Areas Titles can be either NTSC (generally if they originate from the US) or PAL format(EU). STAR WARS THE OLD REPUBLIC COLLECTOR'S EDITION - PC. NUOVO SIGILLATO - NEW SEALED. Seriousness and professionalism make our staff one of the best in this field.